One day I was talking to someone about National Parks I had visited, and I ended up making a list. I realized I had been to quite a few over the years. Since they have always been one of my favorite travel destinations, I decided to post pictures and stories about parks I have visited on my web page and ask for feedback from others. This is intended to be a resource for others who might be planning visits and also a way to exchange information with those who might stumble across my page. What I've written here is only one person's opinion and I'm perfectly aware that another visitor might have a completely different view. I look at the parks from the viewpoint of a visitor who is primarily interested in camping, hiking, and photography. In particular, I like places that are friendly to those who camp in tents and small vehicles like my Volkswagen camper. I'm not, for instance, concerned with whether there are accomodations for big RV's or whether there are luxury hotels within the park. 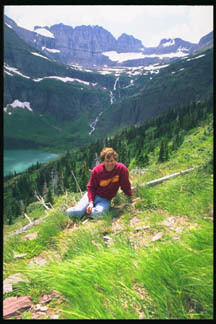 I especially like to look for places in the park system that are not well-known. Lots of people know that Yosemite is a great place, and I agree. Not so many may know that Wind Cave is, in a less spectacular way, also a great place, and that's the sort of thing I hope someone may discover from visiting my site. For each park, I try to list my favorite place to stay, to walk, to sit and contemplate, and something good to read about the park, its history, or the area where it is located. 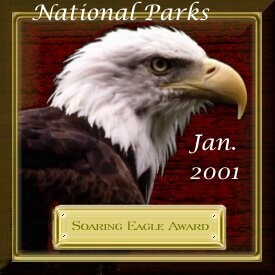 The National Park Service has a web page which gives all the vital statistics for every park. This includes directions, size, number of campgrounds, phone numbers, etc. I don't intend for this page to be a repetition of any of that material, but rather my own thoughts about the park. A link to the official NPS site is always included. owned by William Dummitt. Click here to join the ring. Any comments are appreciated. Send me an e-mail at bill@campingintheparks.com! My Volkswagen page. Restoration of old houses . A 59 Corvette made new : ). See credits for this site.